I had vague recollection of various articles on Ethiopia and the politics of the Tigrean People’s Liberation Front (TPLF) I had written for ERM as its senior editor in the 1990s. But I had no recollection of their content. ERM was in print publication from January 1991 to 2000 when it began delivering content online. I do not have all of the print issues of ERM for the nine year period. Luckily, with the help of attentive friends, we were able to track down a few of those articles recently; and we expect to find many more. I offer the foreword above for a reason. I had often informed my readers that I had little interest or involvement in Ethiopian politics or affairs until the Meles Massacres in 2005. As the world remembers, that year several hundred unarmed Ethiopian demonstrators were shot and killed or wounded with the knowledge, direction and authority of the late Meles Zenawi. I want to correct the record now and apologize to my readers for suggesting that I was involved in Ethiopian affairs only after 2006. I have now determined that I have indeed been involved in the debate over Ethiopia’s destiny barely two months after the TPLF thugs took power. As my commentaries from 1991-92 show, I was present when the TPLF serpent was just breaking out of its shell in 1991. Almost 25 years ago, I predicted the TPLF would become a vampire-state like no other seen in Ethiopia. Mea culpa! (my fault) for not remembering. There is, I believe, a gap between 2000-2005 in my commentaries on Ethiopia, but I cannot be sure. I am sure that whatever articles and commentaries I have written before 2006 will be made available to my readers in the Archives section of my website. I will share all of my writings on Ethiopia in the 1990s and even in the 1980s to the extent we will be able to track them down from a variety of sources. I cannot explain how or why I forgot so many pieces of writings I have done on Ethiopia from the 1990s or perhaps even the first half of the first decade of the millennium. It is true that I have written hundreds of fully litigated legal briefs, motions and writs in state and federal courts during that period. That experience could make anyone forget a lot of things. Perhaps it could it be one of the perils of writing and reading“too much”? It could be said that I suffer from an “affliction” known as furor scribendi (Latin for “rage for writing”). It is an “affliction” I developed as a teenager writing occasional pieces for some of the popular monthly magazine in Addis Ababa in the late 1960s. In every Monday commentary I write, I discover what I believe and do not. In so doing, I “forget” what I had written before because I am set to discover what I believe and do not the following Monday and on and on. Having writ, I moved on! Having writ, I forgot! I do not regret a word of what I wrote! However, I do regret and apologize to my critics who delighted in saying I am a johnny-come-lately to the debate and discussion over Ethiopia’s problems and destiny. I ask them now to enjoy some of my commentaries from the very early days of the TPLF seizing power. They will find out that I was as principled in my criticisms of the TPLF two months after they seized power in July 1991 as I am today in July 2015. I have been on the TPLF’s case for 24 years (I didn’t even know it). I have nothing personal against any one of the TPLF leaders or their minion. There is no question I oppose their unjust policies and criminal practices which divide the Ethiopian people by ethnicity, religion, language, region and gender. Now that Ethiopia has become a bona fide vampire “banana republic” under the auspices of the U.S. State Department with the TPLF dictatorship winning 100 percent of the seats in “parliament” and in the regional “legislatures”, I thought my readers would find my commentary from 24 years ago interesting and principled, if not somewhat forebodingly prophetic. In July 1991, I sensed a gathering cloud of fear and loathing in Ethiopia. In 2015, I believe the ONLY choice is a farewell to the TPLF! In 1991, the gathering cloud of fear and loathing foreshadowed a Noahic flood. In 2015, the gathering cloud of fear and loathing foreshadow no flood; Heaven forbid no blood. The original commentary reposted below appeared in the July 1991 issue of Ethiopian Review Magazine and is available HERE. There are kangaroo (monkey) courts. There are also kangaroo (monkey) elektions. On May 24, 2015, Ethiopia held a kangaroo (monkey) elektion. On June 22, TPLF spokesman Shimeles Kemal said his TPLF party won its monkey elektion by 100 percent because of its success in spurring the Ethiopian economy. The reason is simple. I proved beyond a shadow of doubt that the TPLF claim of double-digit growth is a lie, damned lie and a statislie (statiscial lie). Economic progress or economic window dress? To me, a declaration that the TPLF won the elektion by 100 percent is not a report of final elektion result, it is the final, ultimate insult. A 100 percent election result is not merely an insult to democracy. A 100 percent election result is an insult to our intelligence by a bunch of riffraff ignorant thugs! What do I think of the May 2015 TPLF elektion? I think of the May 2015 TPLF elektion in the same way Meles Zenawi thought about the European Union Election Observer Mission (EUEOM) election report in 2010. Meles described the EUEOM election Report as “useless trash that deserves to be thrown in the garbage”. Well, I say the TPLF’s May 24, 2015 elektion is a heap of useless trash that deserves to be thrown, along with the TPLF, into the garbage bin of history. In 2015, Meles’ prophetic words have actually come to pass. 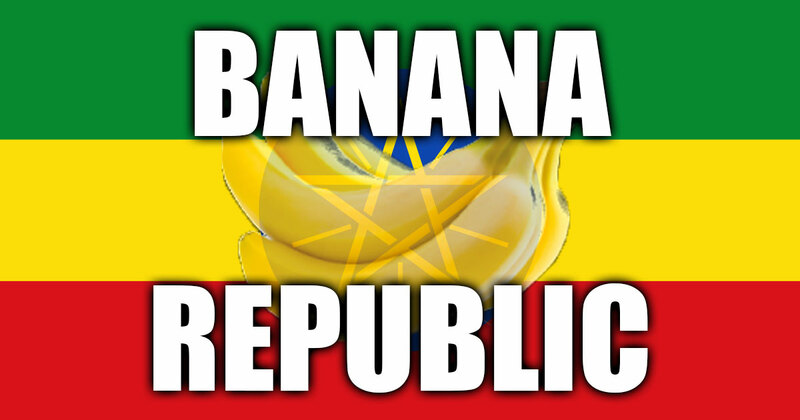 Ethiopia has become vampire “banana republic” run NOT from Capitol Hill but from the U.S. State Department. In April of this year, U.S. Under Secretary of State and the chief U.S. negotiator in the Iran nuclear arms talk, showed up in Addis Ababa and declared out of the blue, “Ethiopia is a young democracy” and that the TPLF’s May 24, 2015 elektion will be “free, fair and credible”. Sherman’s TPLF toadies did not disappoint. Last week, the TPLF declared it had won all 546 parliamentary seats and all 1,984 of the seats in the regional “legislatures”. In May 2014, I predicted the TPLF would win the May 2015 elektion by 100 percent. I was right on the money! I am not bragging; just sayin’! I must confess I and my colleagues got a few nice laughs out of the TPLF’s kangaroo (monkey) elektion victory. The jokes were rolling, some of them admittedly off color; they can’t be repeated in polite company. What’s the difference between a democracy and a thugmocracy? In a democracy your vote counts. In a thugmocracy, your votes are counted by thugs. What do I really think of the TPLF’s May 2015 elektion? Kennedy understood his country’s history well. The English colonial government made peaceful change impossible in the American colonies leading to the American Revolution in 1776, an event memorialized in the American Declaration of Independence and celebrated annually on July 4. In just 4 days, we celebrate American Independence. I look forward to the day when all Ethiopians celebrate their independence form the TPLF! How time flies? From 1991 to 2015! “Time flies over us, but leaves its shadow behind,” wrote Nathaniel Hawthorne (author of “The Scarlet Letter”), the 19th century American novelist. What a dark and gloomy shadow of fear and loathing the TPLF has cast on Ethiopia over the past quarter century! Ethiopia: Beyond Fear and Loathing? In less than a month Mengistu Hailemariam and his Derg have been swept from the Ethiopian political landscape. Victory for the Ethiopian People’s Democratic Revolutionary Front (EPDRF) came quickly and Addis Ababa was captured with minimum resistance. The political implications of this victory however remain unclear. Historic ethnic antagonisms and rivalries continue to inspire an atmosphere of fear and loathing. The EPDRF is viewed with considerable suspicion because it is regarded as a `Tigrean organization’ with a hidden political agenda. Non- Tigreans generally dismiss EPDRF’s claims of multiethnic representation as crass political machination. Amharas resent a `Tigrean victory’ because they feel displaced from what they perceive to be their traditional role in government. The Oromos view the situation as a change without a difference. Other ethnic groups feel they are pawns in a long-standing Amhara-Tigrean power struggle. Many remain suspicious and apprehensive about EPDRF’s intentions or its willingness to share political power. In its military victory, the EPDRF remains under intense internal and international scrutiny. EPDRF leaders have so far shown extraordinary political skill and astuteness in the maelstrom of fear and loathing. EPDRF Chairman Meles Zenawi, aged 37 (whose real name is Legesse Zenawi), has appeared on television and responded to questions in Amharic. He gave assurances that Ethiopia’s flag will not be replaced by the Front’s flag. He expressed his “hope” that the EPDRF will be “an important element in a transitional government.” He has declared the aim of his interim government as one of “establishing a broad-based government to facilitate democratic elections.” He identified “stabilization of the security situation in the country” and famine relief as the top priorities. Meles has stated that detained former government officials will be brought to trial once a provisional government has been established. He promised there will be no vendetta killings or retribution. The most auspicious of the EPDRF statements announced the scheduling of a `political conference’ on July 1 to establish a `broad-based’ provisional government. EPDRF’s support for a referendum in Eritrea remains to be the most volatile and emotional issue to many Ethiopians. EPDRF forces have not openly gloated over their victory. They have been restrained in their use of violence and have refrained from large-scale vendetta killings. They have banned public demonstrations including those supporting them. Scores of youthful anti-American demonstrators were killed or injured by EPDRF forces while gathered before the U.S. Embassy. Several hundred former officials who have been placed in detention, including Legesse Asfaw and Tesfaye Wolde Selassie, are awaiting trial. Independent sources and western journalists confirm that the detainees are being treated well. EPDRF leaders have called on the country’s bureaucrats to seek their cooperation in reactivating civil administration. Kebele committees were established to conduct house-to-house searches for weapons. The highway to northern Ethiopia which had been closed for years is now open and famine relief activity appears to be underway. EPDRF’s critics remain unconvinced. Skeptics see sinister motives behind EPDRF’s actions. Some believe that EPDRF leaders are merely buying time until they are better able to consolidate their authority. Others claim that EPDRF leaders are cleverly manipulating democratic symbols to ultimately impose one-party Tigrean rule. It is also said that the EPDRF is merely responding to external and internal pressures and will show its implacability once it is firmly entrenched. Some even cynically suggest that the EPDRF aims to eventually breakup Ethiopia so that it can merge Tigre with Eritrea and establish a new state. The EPDRF has taken over state functions but does not regard itself a formal governmental body. EPDRF officials have said that they will defer decisions unrelated to public security until the establishment of a provisional government. This includes the trial of former officials who are in detention. Winston Churchill once remarked: “The problems of victory are more agreeable than those of defeat, but they are no less difficult.” The EPDRF and the provisional government it will help set up are likely to face their greatest challenges in victory than in their struggle to oust Mengistu. They have inherited complex problems. The new government must walk a tightrope over a country teetering on the precipice of ethnic fragmentation, economic disaster and cataclysmic famine. Good intentions and good faith will not suffice. The EPDRF leadership is `between a rock and a hard place’ particularly on the question of socialism. For many EPDRF leaders the decline and irrelevance of socialism must be utterly disconcerting. Arguably, many of these leaders including Meles, reportedly a one-time admirer of Stalinist Albania and a Marxist student activist while a medical student at Addis Ababa University in the early 1970s, attained their political education and maturity in the uncompromising tradition of Marxism-Leninism. They looked towards Albania for a model. Ironically, three weeks after EPDRF’s victory Albanian communists voluntarily handed over power to non-communist elements effectively ending communist rule. Now the EPDRF finds itself facing a critical choice: muddle through with an unworkable and irrelevant ideology or openly renounce socialism and embrace democratic rule. Statements by Meles suggest that the EPDRF is indeed shopping for some form of liberal democracy; and not only because socialism has been discredited but also because the democratic way is the only game in town. The US and other Western countries have preconditioned any cooperation and assistance on the establishment of democratic institutions. US official Herman Cohen has obliged Meles by sending him the political writings of the framers of the American constitution. Liberal democracy, at least in the American tradition, presupposes constitutional government with specific guarantees of individual freedoms. The powers of government are subject to constitutional constraints. The American experience also argues strongly for the division of powers between the national government and local governments under a system of federalism. In practice, periodic elections, party competition, free speech and freedom of political association are essential. Conflict is managed through compromise, negotiation and tolerance of different views. Economically, liberal democracy presupposes a free enterprise system with the role of government limited to regulatory functions. In a society with little democratic tradition and a long history of dictatorial rule, the birth of constitutional government will be painful and even chaotic. In such circumstance, the sword often appears instinctively more appealing and efficient than laborious negotiation and compromise. But violence is its own antithesis. It begets hatred, fear and more violence. The EPDRF and the provisional government must recognize that Ethiopia can no longer be yoked by violence to preserve its integrity or attain harmony. Ethiopia’s new leaders must be genuinely committed to democratic values and institutions. Thomas Jefferson aptly observed: “I know of no safe depository of the ultimate powers of society but the people themselves; and if we think them not enlightened enough to exercise their control with wholesome discretion, the remedy is not to take it from them, but to inform their discretion by education.” The new leaders must not only educate but also define a new vision for the society. They must undertake a means to change the way Ethiopians think not only about government, society, and politics but also themselves. The educational task is a unique one. Ethiopians must first unlearn and discard long-held prejudices, unfounded fears and blind ethnic aversions. We must learn tolerate each other in our diversity of views and beliefs. We must learn to respect and celebrate each other’s ethnic heritage. Only then can we begin to appreciate the innate equality of all human beings and the egalitarian value of democracy. There is great expectation about the July political conference. EPDRF leaders have pledged to facilitate broad-based participation in the political dialogue. However, they have not been clear on the mechanics of participation. Understandably, it is a delicate task. Many troubling questions remain unanswered. Will participants to the conference be invited? How will groups or representatives of groups be selected? Will EPDRF leaders chair the conference? Will members of the former regime be allowed to participate? Will organizations that have opposed EPDRF in the past be permitted to participate? Will EPDRF insist on certain portfolios such as defense in any provisional government? Where will the conference be held? If in Addis Ababa, what guarantees will be given to participants? Will the conference be televised or broadcast on radio? If the conference is held as scheduled, EPDRF’s leaders will likely experience their first baptism in the fire of democratic politics. They should be prepared to face challenges to their legitimacy, competence, sincerity and intentions. As conference organizers with colorable title to leadership, they must show considerable political will and skill. They must strive to harmonize the diversity of views and opinions. They cannot afford to be temperamental and must show an infinite capacity to negotiate and compromise. No better time to lay the groundwork for genuine democratic government than now. In the end what is at stake is not merely the construction of civil government but the healing of a nation wounded deeply by famine, poverty, and ethnic warfare. The choice is clear: A farewell to arms or a farewell to Ethiopia. In 2015, I believe the ONLY choice is a farewell to the TPLF. It would be ironic to see the TPLF that cakewalked into power, firewalk out of power.